HomeResourcesBeyond the Buzzwords: How Do You Show Soft Skills on Your Resume? With this in mind, the challenge then becomes how do you show and substantiate culture fit and soft skills on a resume? How do you go beyond the buzzwords to actually prove you possess the soft skills the company desires? Not Easily Proven: First, let’s address the fact that inserting a soft skill on a resume doesn’t mean the person actually has a strength in that area. People can say they’re proactive, problem solvers, team players, and have excellent communication skills—but it doesn’t take long to figure out that not everyone actually possesses those soft skills. What the Employer Wants? Let’s say you want to include a few soft skills interspersed throughout your resume. How do you know which ones are the most important and which the employer would value? Recovered $1,000,000 lost revenue through attention to detail and meticulous review of 750 client accounts. Notice how it includes attention to detail and meticulous? These are soft skills, but possessing them as a strength enabled this person to find a critical error resulting is recovering more than $1 million in previously lost revenue. Without her attention to detail she would have overlooked the hidden error. You can do the same with any soft skill that you possess—simply insert the soft skill within the context of the accomplishment. It’s true that employers aren’t searching for candidates by using soft skills as search terms. They’re using industry-specific keywords and reviewing accomplishments. Two great alternatives to still ensure your soft skills are seen by employers who are assessing them are to include them on your cover letter and within your LinkedIn profile. On your cover letter: Link the soft skills to culture fit. 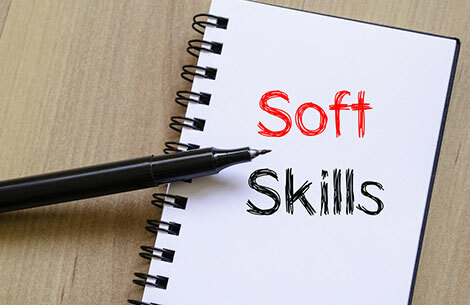 There’s a definite connection between soft skills and culture fit. What does the culture look like at the company? What do they value? Find the connection between your strengths and those values, and then point out that connection within your cover letter. Soft skills in your LinkedIn Profile: One of the wonderful attributes of your LinkedIn profile is that it provides an additional avenue for employers to learn more about you. That’s exactly what they’ll do too. Once they’ve decided they want to learn more about you, the first place they’re going to go is to your LinkedIn profile. It offers more flexibility than the rigid targeting and focus that a resume requires to get through the screening process. Use the opportunity to incorporate a few soft skill strengths within your profile. Be selective and choose those that truly represent a strength you possess that you can validate, and share examples of results that those soft skills contributed to. BONUS TIP: Ask a few colleagues to offer a recommendation focused specifically on one or two soft skills that you want to draw attention to. This is a great way to offer validation and “PROOF” that you possess those specific soft skills. So, if soft skills are becoming an important factor in the hiring decision so much so that employers are seeking tools to assess them in candidates, and if its driving future recruiting trends, then you need to figure out what they want to see. My advice? Do your research! The position announcement: The first and most obvious place to go is the job ad. Employers include culture values and desired soft skills in the position announcement. This is your first stop. Other job ads: Find other positions the company has posted and review what the company has to say about what they offer employees. You can usually find great insight into culture fit, values, beliefs, and desired soft skills here. Use social media: Check out the company’s Facebook and LinkedIn profile to further research the company’s culture and values. The more information you find, the better idea you’ll have about the soft skills they value in their employees. Company website: Companies include information about their mission, beliefs, values, company culture, all on their website. Research here to find more information to help you choose the right soft skills. Company reviews: I recommend visiting Glassdoor.com to find employee reviews of companies you want to target. The advantage here is twofold. You could find a wealth of information about the soft skills the employer wants, plus the culture and management style of the company. Great information to help you choose the right soft skills that align with your strengths. The other advantage is that based on these reviews you’re going to have a better idea of whether you want to target that company or not. So we’ve addressed the three challenges with soft skills on a resume and in a job search and how to best tackle them. If you’re one of the 74% of people open to new opportunities this year, and you’re searching for help with your resume, contact me on LinkedIn or visit my website to find help now.